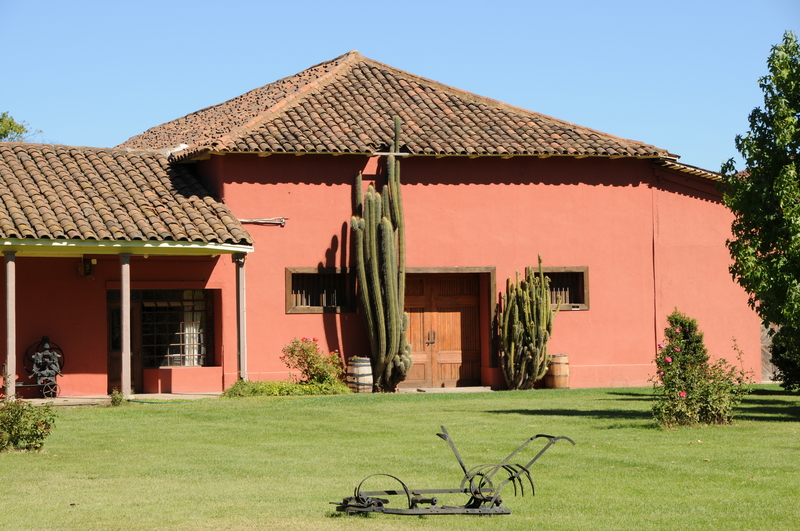 South of the capital city of Santiago, Chile, I drive from the Colchagua Valley along Highway 5 – parallel to the Andes Mountains. I take a road that leads east toward San Clemente, then head south along Camino a Palmira across the Piduco River. I soon turn right toward the Casa Donoso winery and guest house, owned by Tahitians and managed by a Chilean. I park in a gravel lot in the shade of trees. A tall, slow-stepping man wearing a cowboy hat, jeans, and a collared white shirt paces toward the parking lot. He appears to be in his mid thirties. A gold chain hangs around his neck. 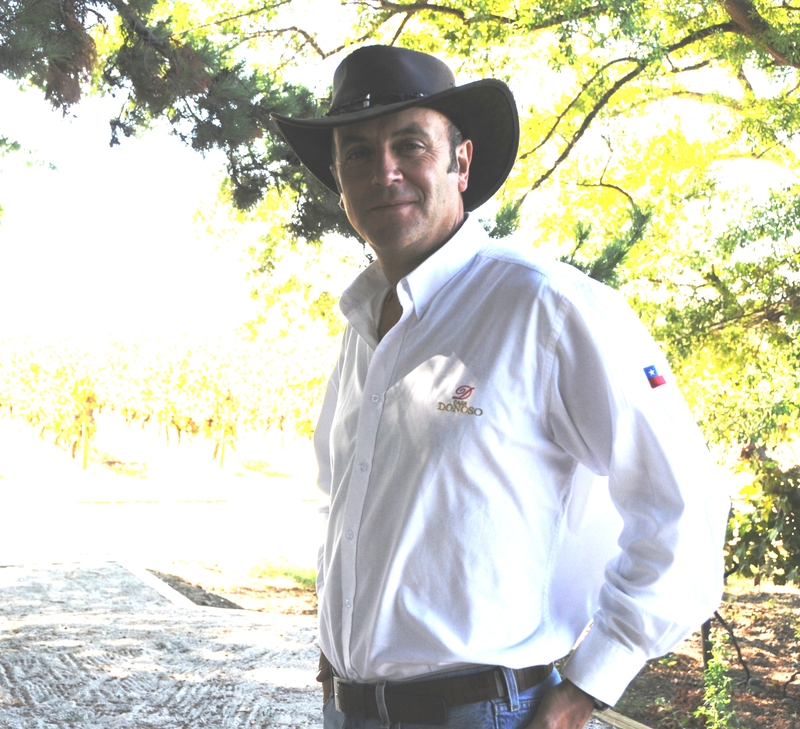 Speaking in graceful, articulate English he introduces himself as Alvaro Arriagada, manager and winemaker. He has three children. His wife is an architect. 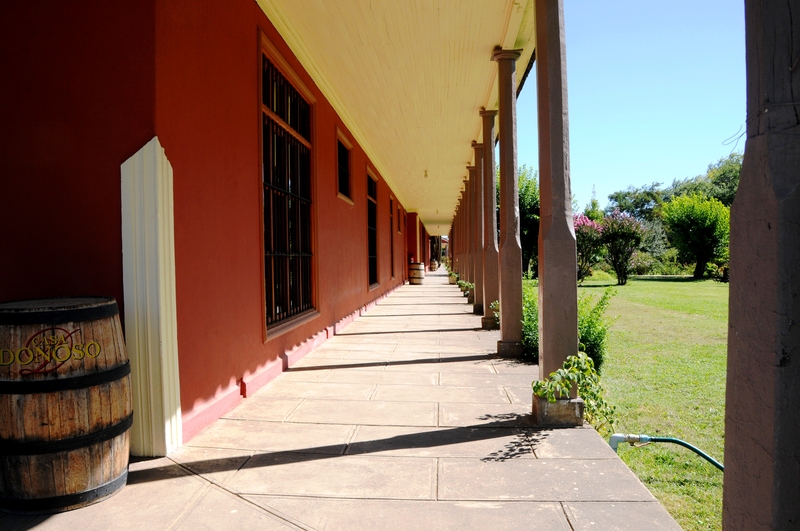 Together we walk to a long red brick building with Spanish style terra cotta roof tiles before a primly trimmed lawn. 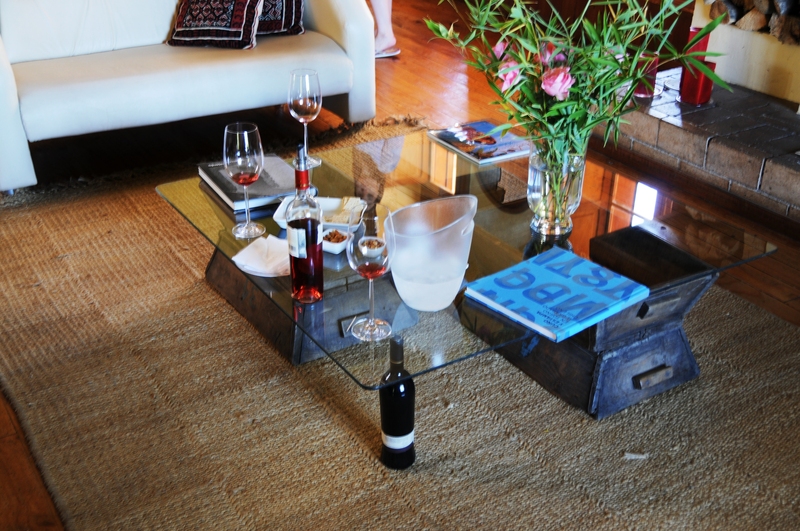 We step inside a large ranch-like sitting room and sit on a large couch, close to the ground. The glass tabletop rests at two corners on wooden grape boxes, on a third corner on a stack of books and on a final corner on a wine bottle. The attractive arrangement was put together not for style, Alvaro explains, but due to lack of funds to buy a table when they originally started renovating the building. 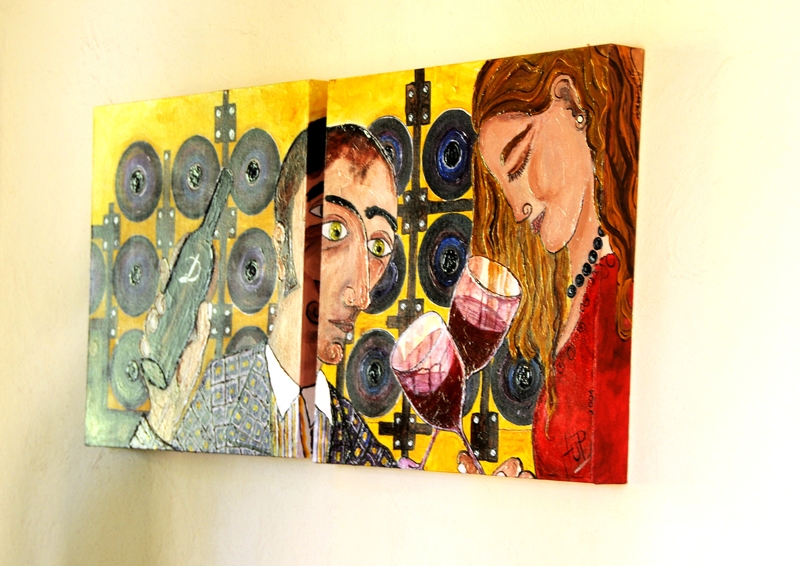 I look at the long canvas his wife painted that shows a couple sniffing half filled wine glasses before rows of barrels. “Since I was young I wanted to work in the country. I didn’t want to be a winemaker. I studied to be an agronomist engineer. But the first job they offered me was in a winery. I said okay, I will do it. “I realized that getting into wine was something very special because nobody needs wine. It’s not something vital, not something that you’re gonna die if you don’t have. But it gives you a quality of life. People don’t realize that today you need something extra. Like good music. Like having time for reading. Or eating. Something extra. Something like slow life. That means you have the time for appreciating wine, music, lots of things. These are the things we need to indulge in because it’s healthy or good or stable. That’s the thing you begin to learn with this industry, completely different to others. You’re selling a way of life. “Normally I try to make a plan for each day: operations, financial. Sometimes the afternoon is time for meeting other people. The administration of time is very important. Very important. That gives you a very good quality of life. “I have been 15 years working with wine. The most difficult part is to sell the value. We must build this product, this label, this history. That’s one of the biggest challenges. Because you must make the whole business work. You must think all the time of short and long term. “The more and more you are the winemaker, you learn how to blend. Once we invited the best sommelier from Belgium on our team because they wanted to get the blend. So we were blending. Before that I would not believe that one percent of one variety of a red wine would be so aggressive. I say, one percent, what are you talking about? But we found that if we added one percent of one variety, everybody saw it was not the right taste. So this is part of the art. The woman enters again, saying “El almuerzo está listo!” We step next door and sit at a large table draped with a white tablecloth. 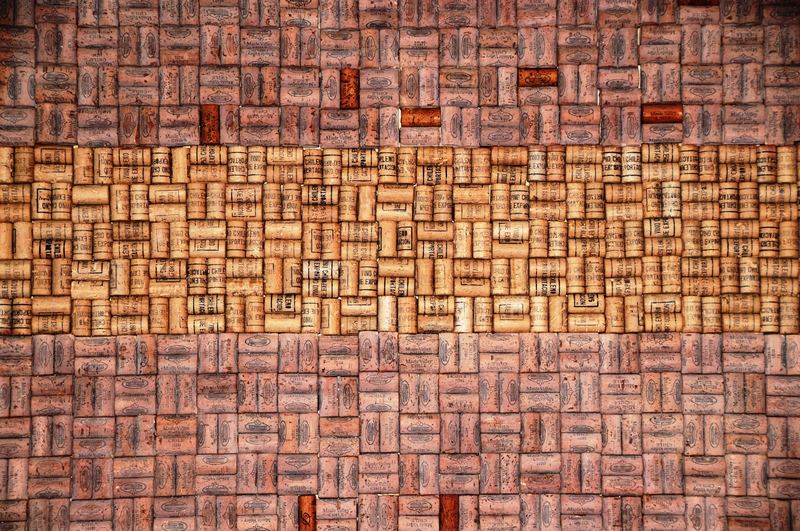 The table stands before a floor to ceiling mirror, framed by diligently arranged corks. Alvaro pours glasses of Sauvignon Blanc for the shrimp appetizer. We are next served salmon, together with a cheese and onion omelet. With this we drink a glass of Bicentenario Cabernet Franc.